A groundbreaking for Design Within Reach was held at South Afton Industrial Park on Aug. 15, 2018. 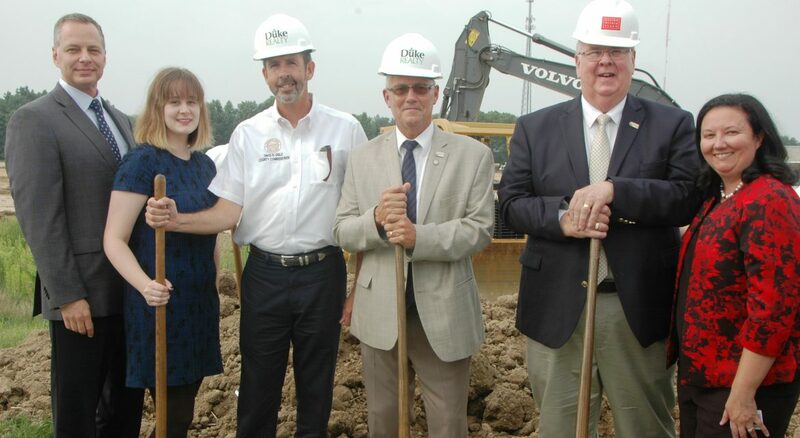 From left, Andy Kuchta, Director, Community & Economic Development; Development Specialist Allison Murcia; Commissioners David Uible, David Painter and Ed Humphrey; and Adele Evans, Assistant Director, Community & Economic Development. South Afton is the first industrial park in Southwest Ohio to receive the SiteOhio authentication. It joins 12 other industrial sites throughout Ohio. South Afton comprises 242 acres at Half Acre Road and State Route 32 in Williamsburg Township. Its first project, a distribution facility for upscale furniture manufacturer Design Within Reach, is expected to open next spring and will employ 85 people. To obtain the authentication, Clermont County had to complete a number of investigative studies as well as install infrastructure on the site. The county began working to accomplish this in 2016, the year it purchased the property. The infrastructure included 2,000 linear feet of road, water main and sanitary sewers, storm water infrastructure, a natural gas line, and conduit for electric, telecom and fiber. All told, the county has invested $2.5 million in infrastructure at South Afton. The studies included an environmental Phase I report, a geotechnical report, a historic and cultural resources report, a wetlands study, and an endangered species study. Detailed information had to be provided on utility excess capacities, including water, sanitary sewer, natural gas and electric. Duke Energy worked closely with the county on the site. About South Afton Industrial Park: South Afton is a 242-acre industrial park at the southeastern corner of State Route 32 and Half Acre Road in Williamsburg Township. The land was purchased by the Clermont County CIC in February 2016 for $4.9 million, using proceeds from the Ivy Pointe development in Union Township. An economic impact study by the Economics Center of the University of Cincinnati estimated that the industrial park would eventually create more than 1,800 direct jobs and more than 1,600 indirect jobs. Read more here: http://cincinnatiohioindustrialpark.com/.